Autumn has arrived a bit late here in the South due our our unseasonably cool and wet summer. 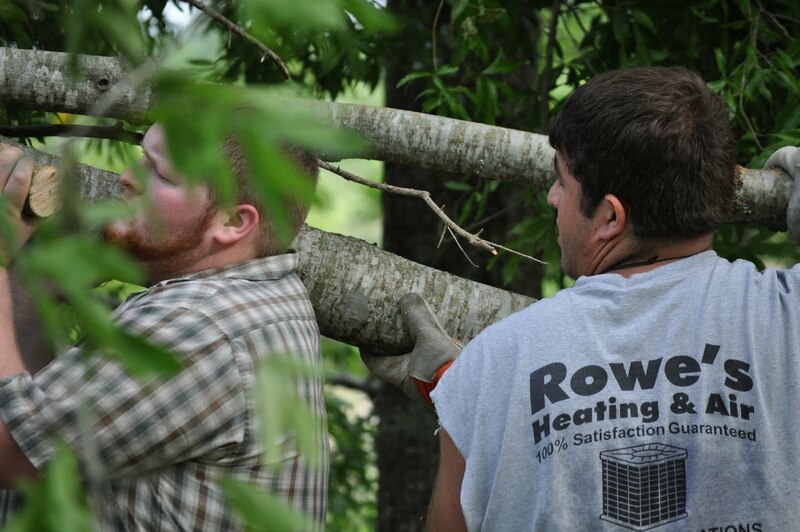 We are just now catching glimpses of color in the trees here in South Carolina, but it is coming, as are the much cooler temperatures and shorter days. 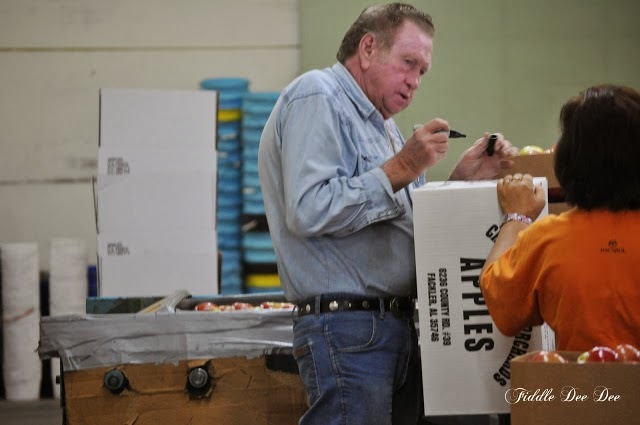 I do love autumn and all of the wonderful traditions and fun our family enjoys together throughout the season! 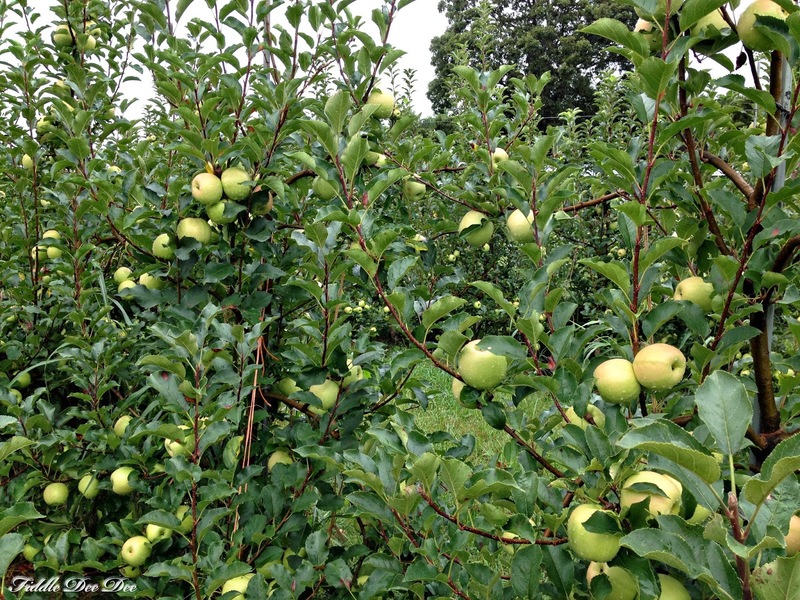 Of all out traditions, I do have to say visiting an apple orchard with my Momma is my absolutely favorite. It has been a tradition of ours for many years now, one that I had to break last year because of the distance between us. This season I decided, distance was not going to be an issue, so when we discovered an open weekend without football and band competitions we loaded up our car and headed home to Tennessee for the weekend! 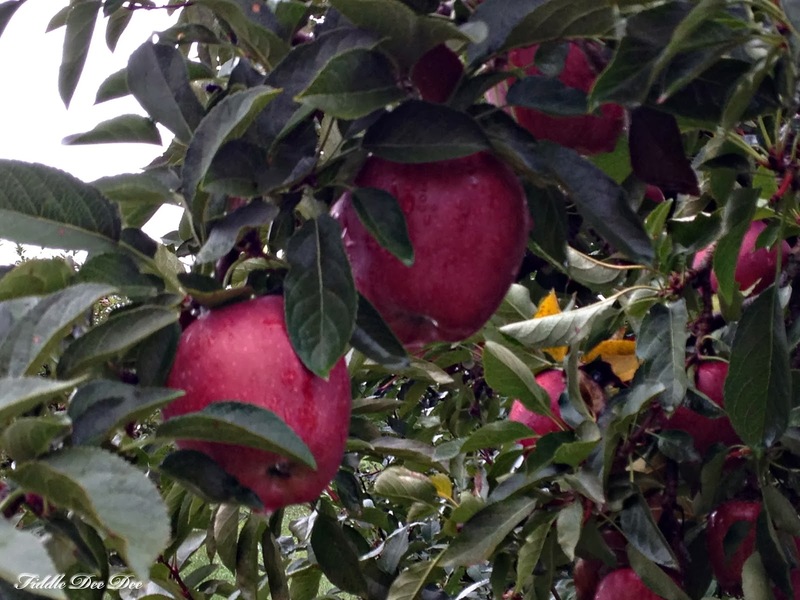 Our short road trip was full of surprises and so much fun that included spending the day with Momma driving the country backroads of North Alabama to our favorite orchard; Crow Mountain on top of the mountain in Fackler, Alabama. 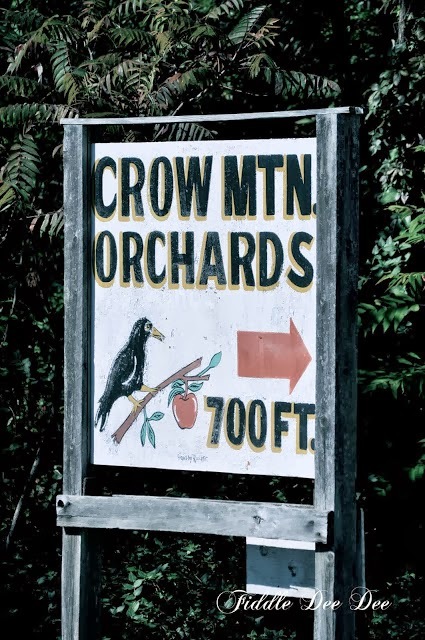 Crow Mountain Orchards, owned by Bob and Carol Deutscher, has been in operation since 1974 and is a must-do highlight of our autumn traditions. 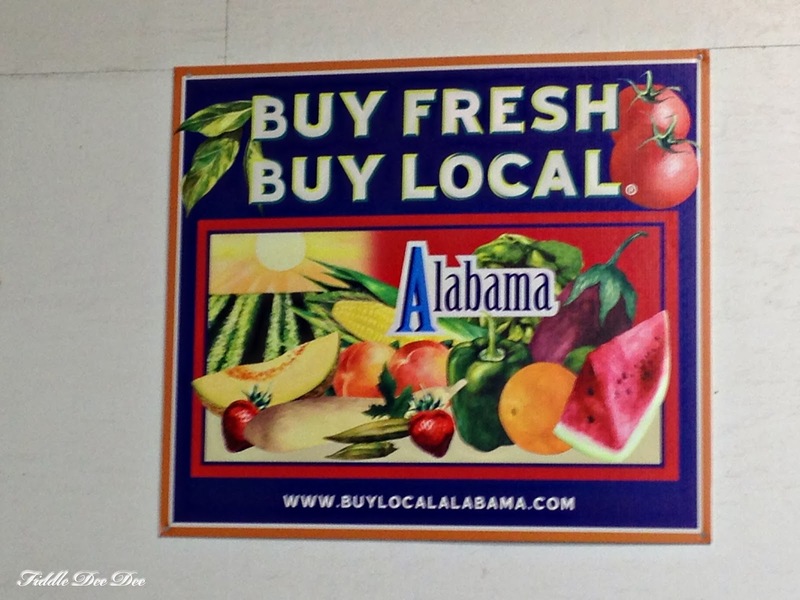 It is also very popular among the North Alabama & Middle Tennessee locals as they are packed each and every time we visit! One thing I love about Crow Mountain is all the variety that they grow. 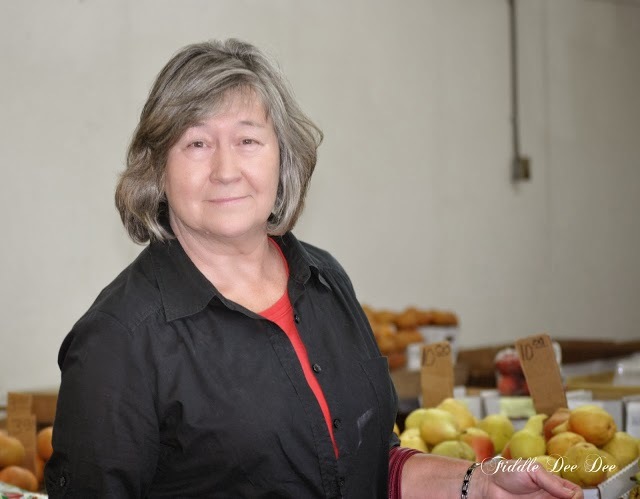 Of course their biggest crop is the crazy assortment of apples in the fall, but during the summer months they also have peaches. 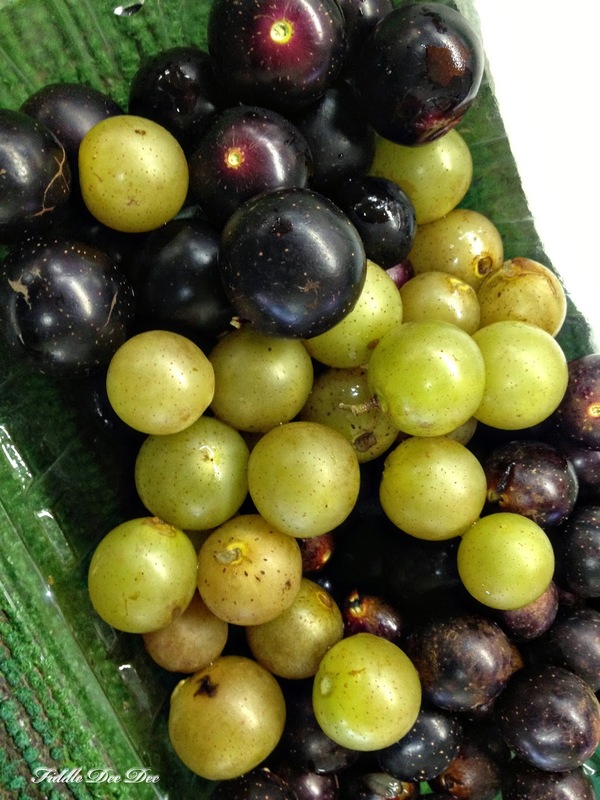 Also in the fall you might find luscious Asian Pears, Muscadines (these were filling my palm they were so large, and oh so sweet! 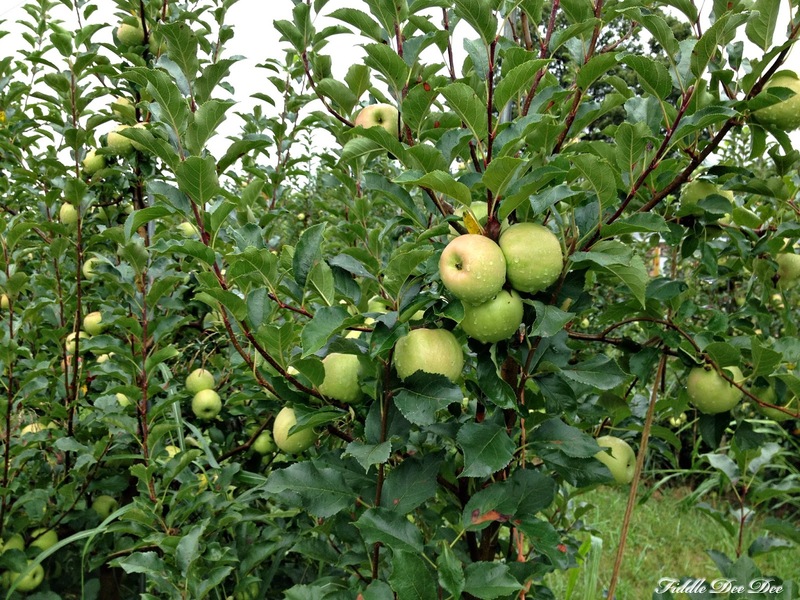 ), and fresh apple cider! 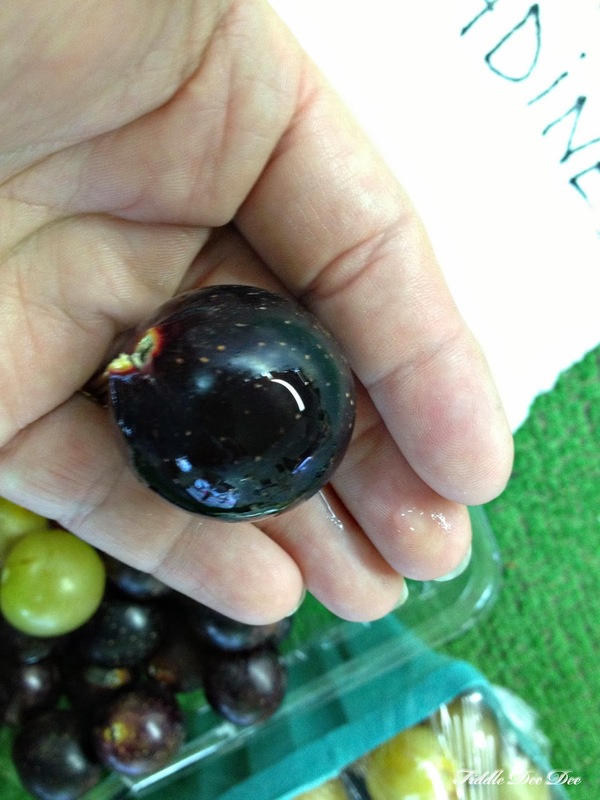 I do love to buy local and not imported fruit! 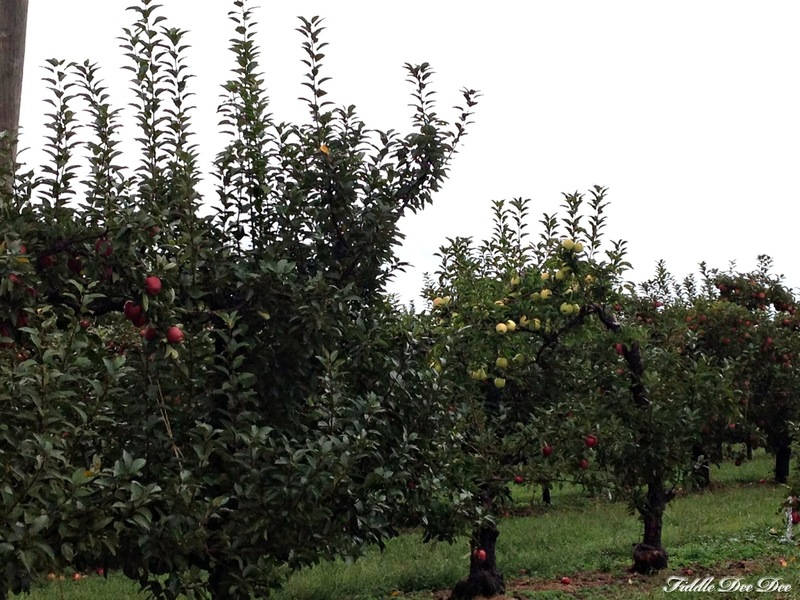 Even though our day was very overcast and a little drizzly the orchards were still beautiful and brimming with fresh fruit just waiting to be picked! Couldn’t you just eat this right off the tree? 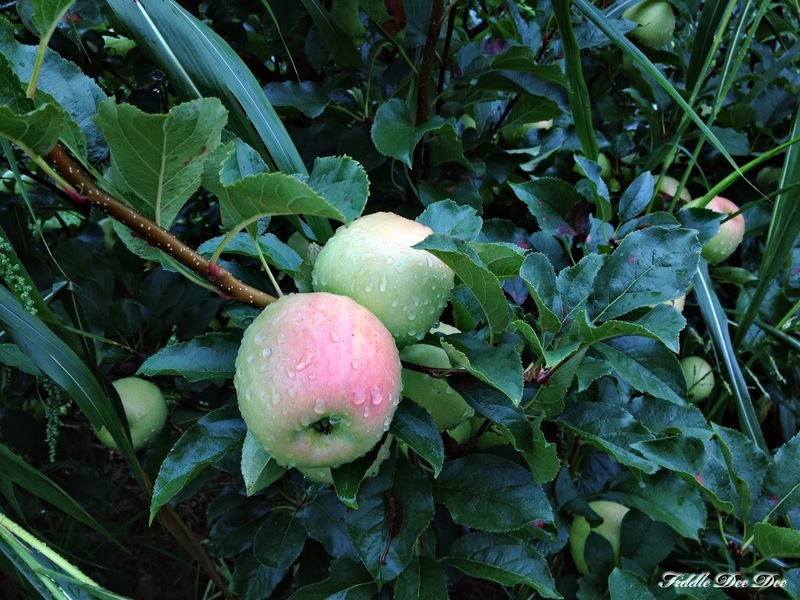 We purchased delicious Jonathan & MacIntosh apples for their tart flavor just perfect for baking and making apple butter. I also bought two gallons of sweet and tart cider to freeze for a little hot spiced apple cider this holiday season. I do love those country backroads and the beauty of our home in north Alabama. 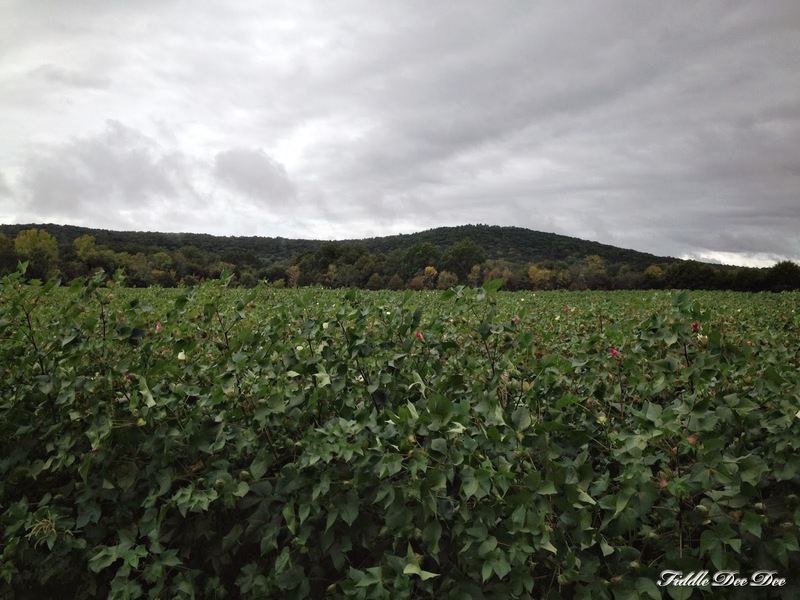 The cotton fields we passed were in full bloom and just captivated me. 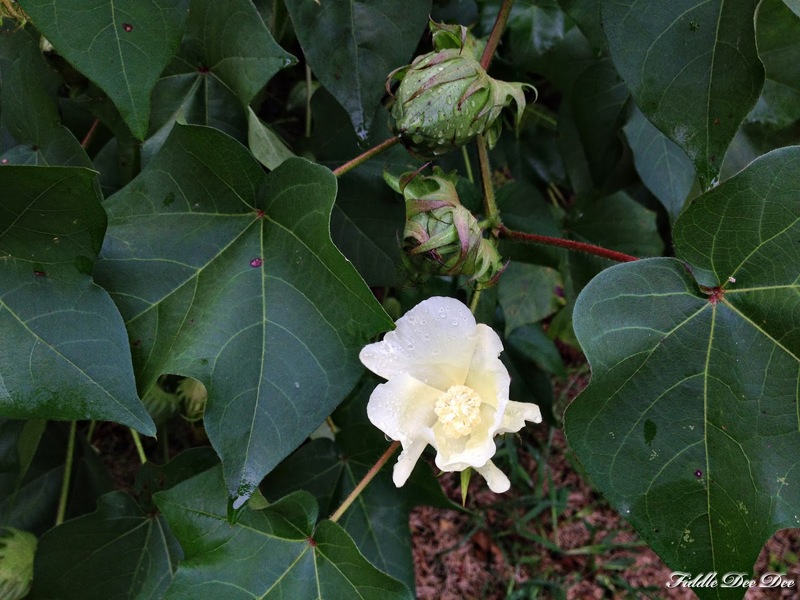 Usually the cotton has already popped when I make this trip, but with things just a wee bit behind, I enjoyed the beautiful flowers on each plant. 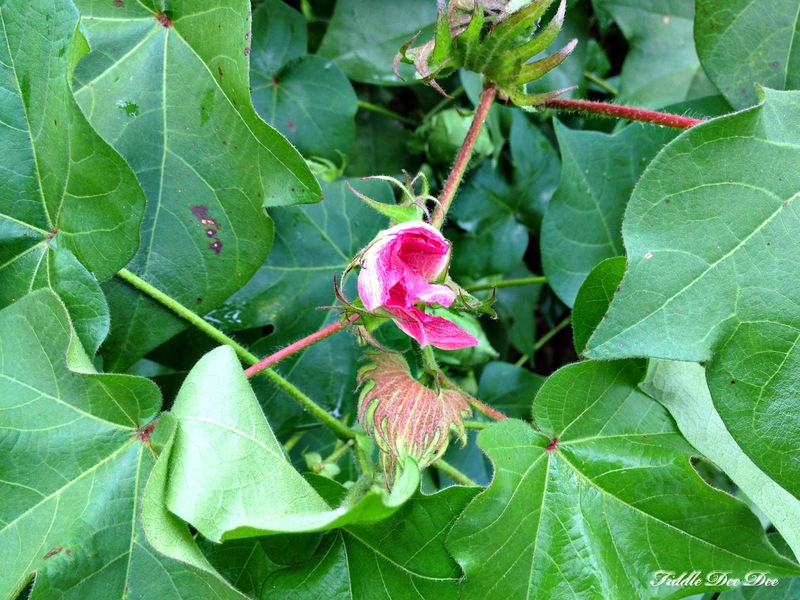 I asked Momma (who grew up picking cotton in Alabama) why the cotton plants had both pink and creamy colored blooms. 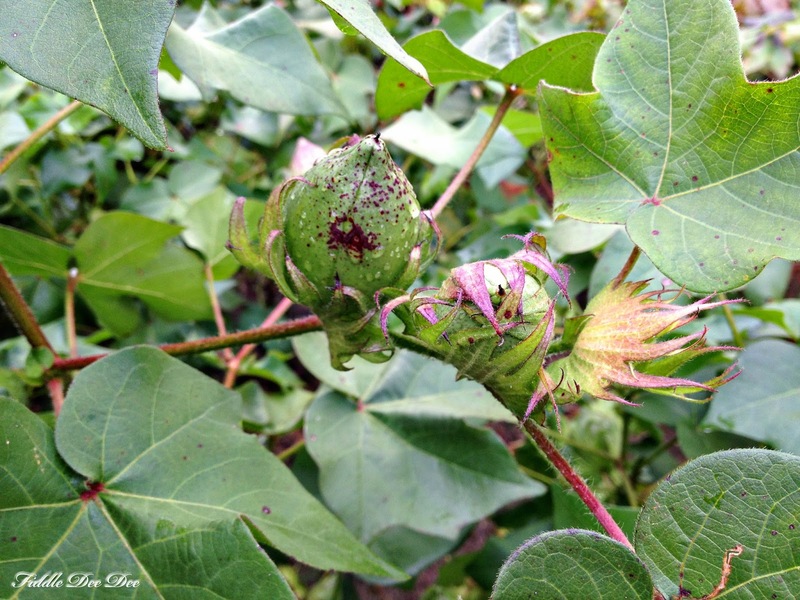 She told me that the petals change from creamy white to yellow, to pink and finally a dark red before they whither and fall off of the plant, leaving behind the green cotton bolls. All of this happens in just a matter of days so actually catching so many blooms was very lucky! Love the mountains in the background of this beautiful field! 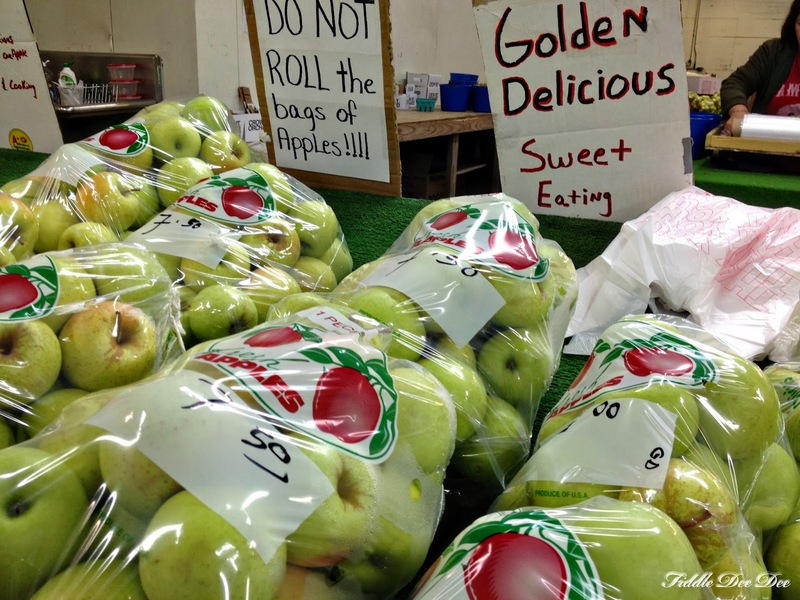 I have so many plans for my apples…. 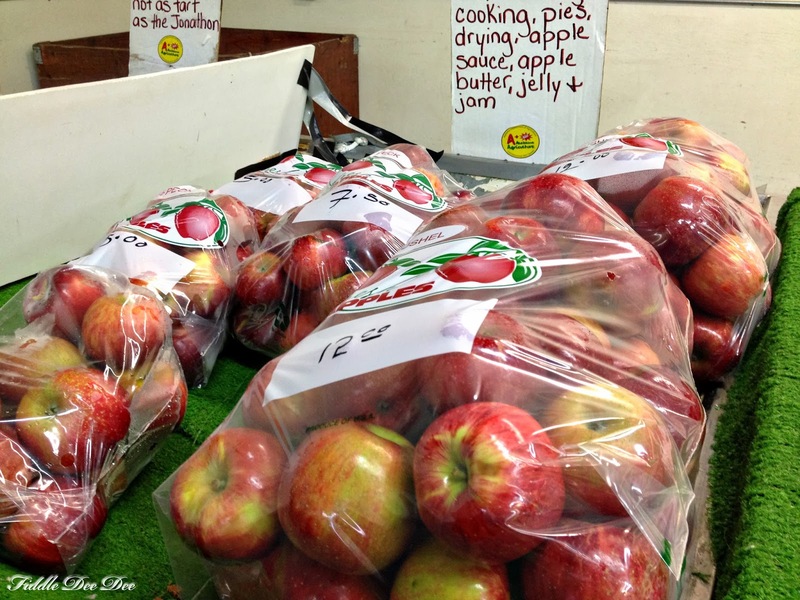 thinking a pie or two, preserving a few for the winter and at the moment I’m working on apple butter. Honestly, I can’t wait to share my simply scrumptious recipe with you! 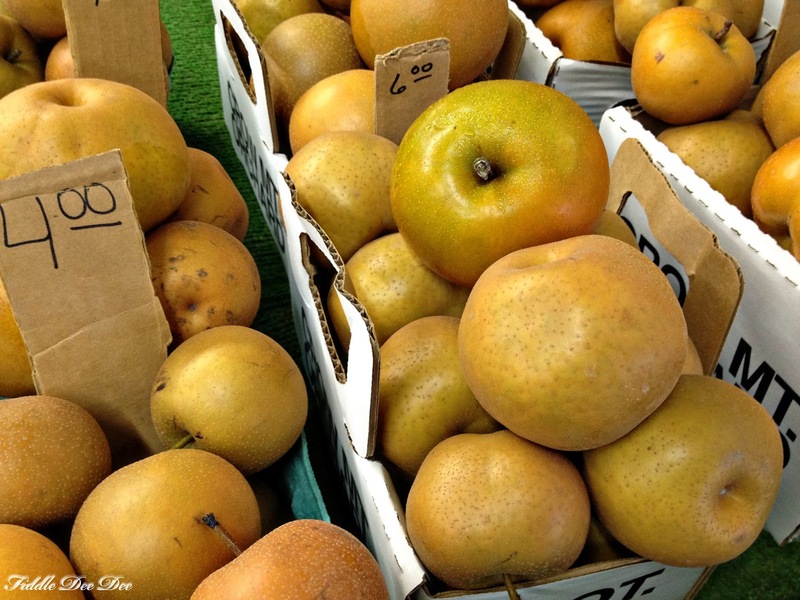 My mouth is already watering and I’m craving a hot buttered biscuit with that fresh fruit butter now! 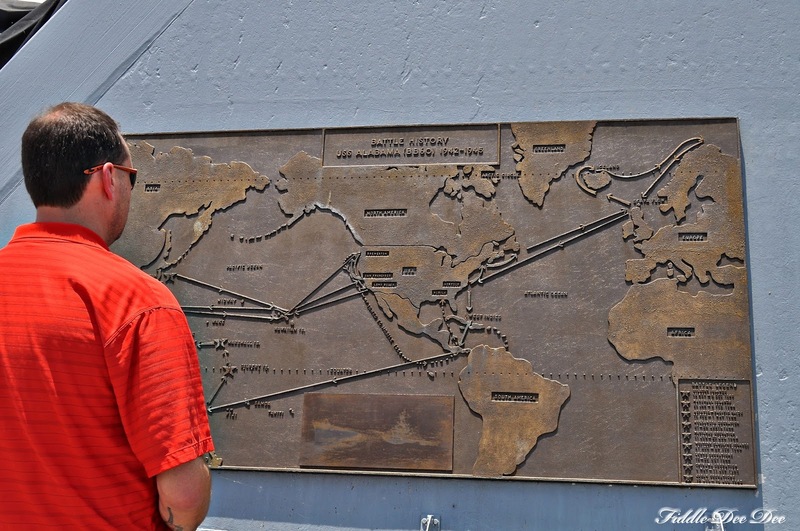 Traveling with my hubby is always an adventure, and when you add Naval history to the mix he becomes like a little boy just waiting for the next adventure. 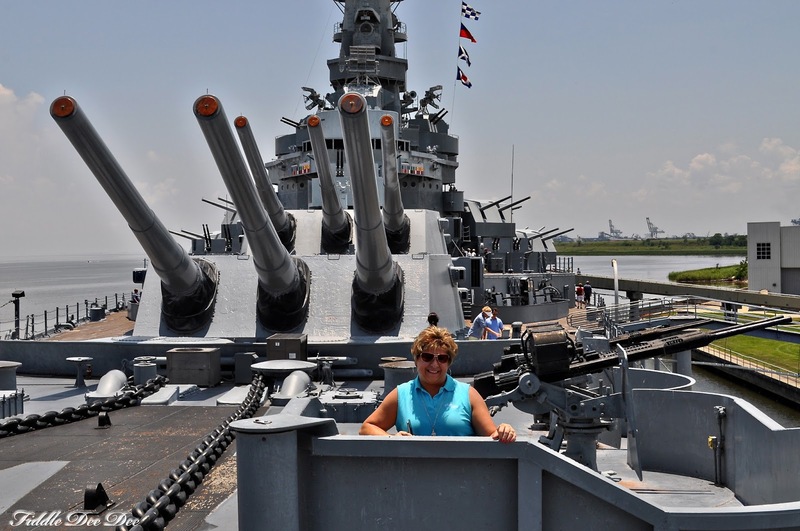 So was the case with as we made a stop-over in Mobile, Alabama and visited the magnificent battleship USS Alabama and submarine, USS Drum as we made our way to Palm Beach for yet another meeting. 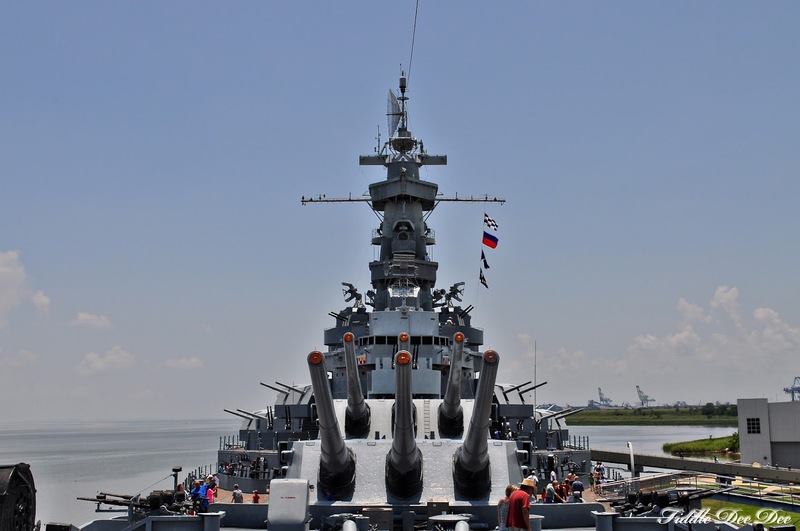 The keel of the USS Alabama was laid in 1940 as hostilities across the Atlantic were heating up in Europe between the British, French and Nazi’s, but America was not yet at war. 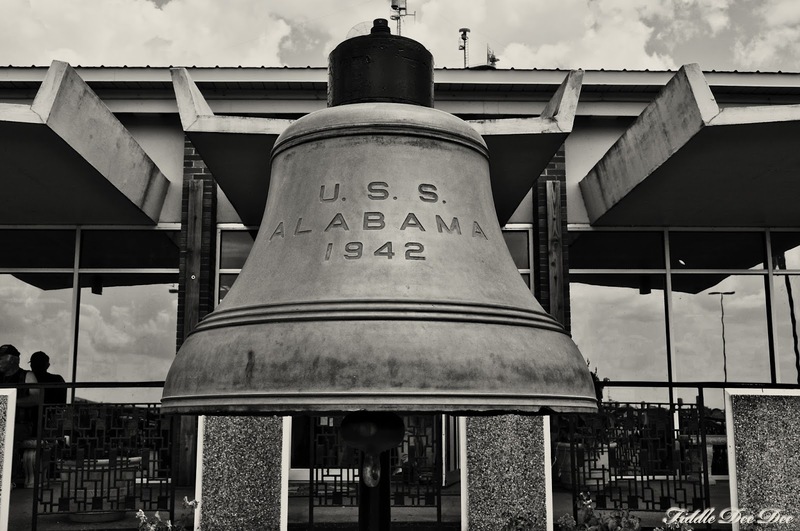 This particular ship was the 8th to bare the name Alabama and completed her sea trials in 1942. 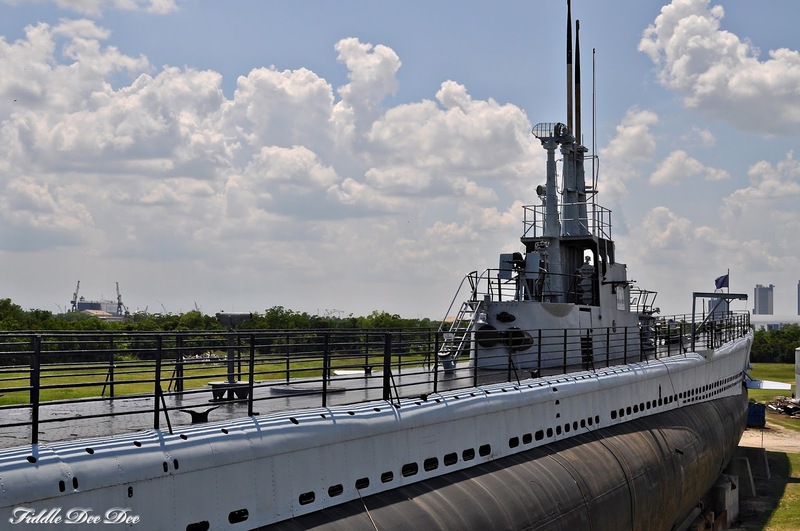 Weighing 44,500 tons and 680 feet from bow to stern, She was immediately put into service in the Atlantic Ocean sailing from Norfolk, Virginia with a job of protecting Russian and British convoys. 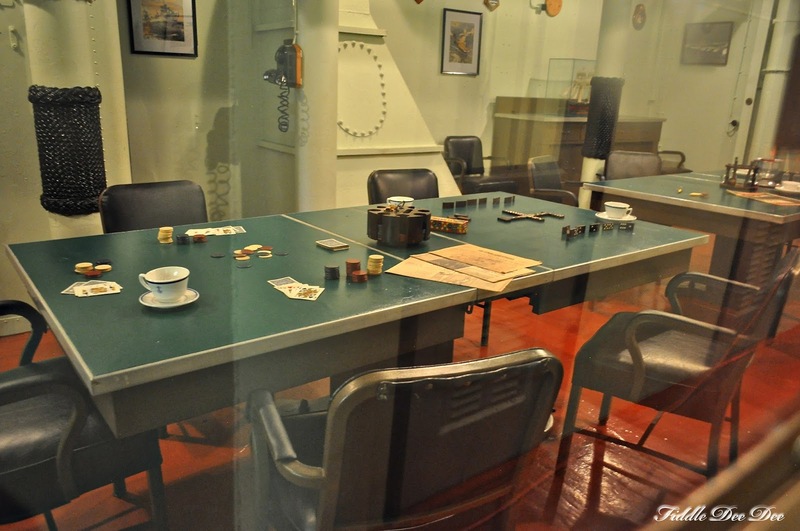 After a brief period in this role, The Alabama was sent to the Pacific clearing the Panama Canal in August 1943. 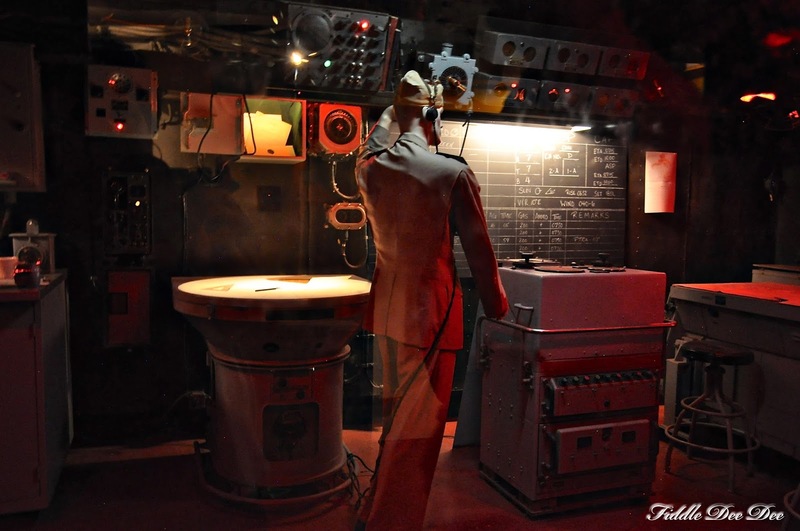 In the Pacific the USS Alabama and her crew of sailors and marines served valiantly in the Pacific war against Japan, accomplishing all of her assigned tasks. 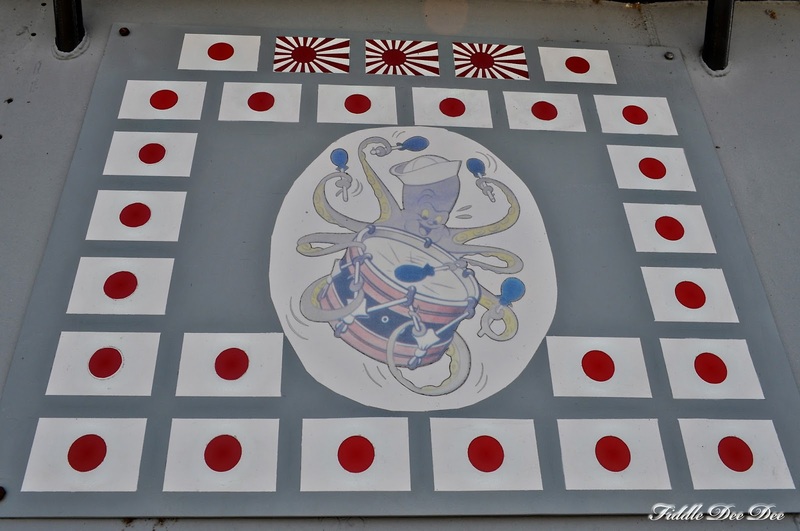 She saw 37 months of action, participating in nine major battles of the Pacific. 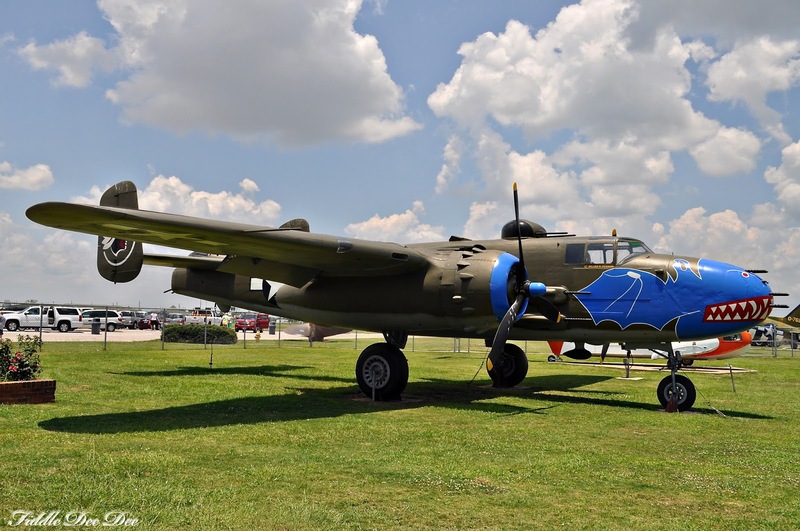 During this time she never saw any causalities or suffered damage from enemy fire; a huge accomplishment! After the end of the war, the Alabama dropped anchor in Tokyo briefly and then took on 3700 servicemen to travel back to the US arriving in at the Port of San Francisco on Navy Day, 27 October 1945, bringing our boys home form war. Her service was complete. 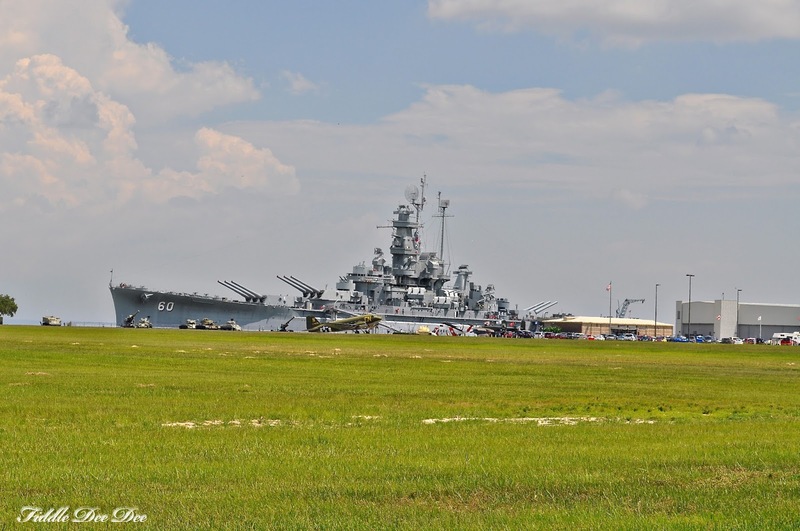 Unlike many ships of the time, the USS Alabama only saw action in WWII and was decommissioned quickly; 1947. Due to the cost of trying to maintain the “Peacetime Navy”, in 1962 it was decided that the Alabama (along with several other great ships) would be scrapped. 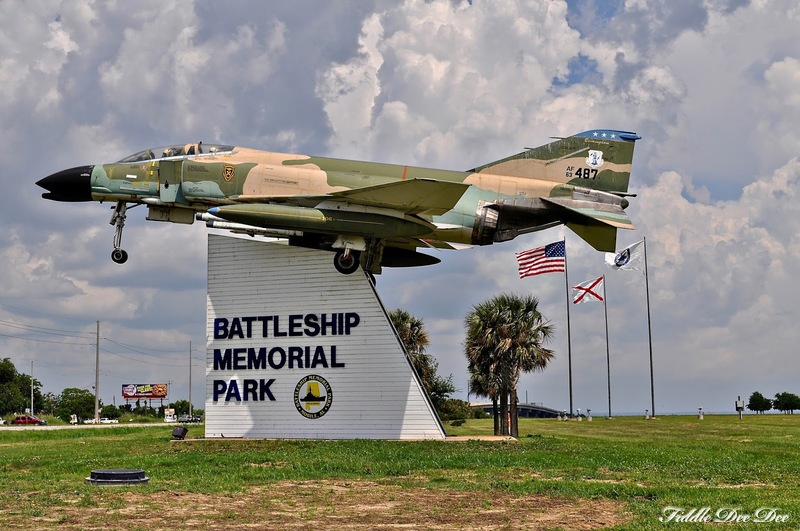 Shortly thereafter a campaign was launched to bring the mighty ship to Alabama as a memorial to the many sailors and soldiers from Alabama who had served. Alabama school children raised almost $100,000 in mostly nickels, dimes, and quarters to help bring her home to her final resting place. 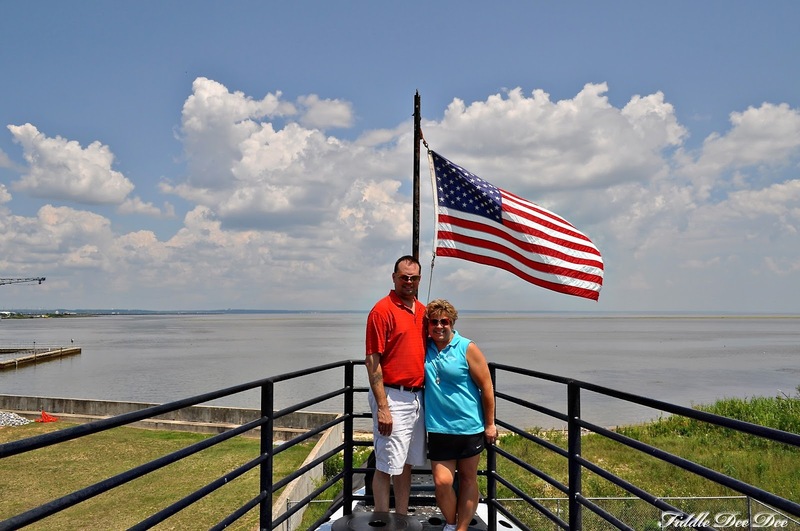 Having parents born and raised in Alabama as kids of the Baby Boom, the USS Alabama means a lot to both of them. They were two of the school children who donated their hard-earned changed to help with this effort. They were given a gift for their contributions; each received a lifetime pass to visit the great battleship in Mobile Bay. In 1972, seven years after the ship opened to the public, they finally got a chance to use those passes for the first time. It was also my first visit to the beautiful and historic ship. Dad & Momma were just 22 years old here! A lot has changed since that 1972 visit which Audley and I were able to enjoy on our own trip. 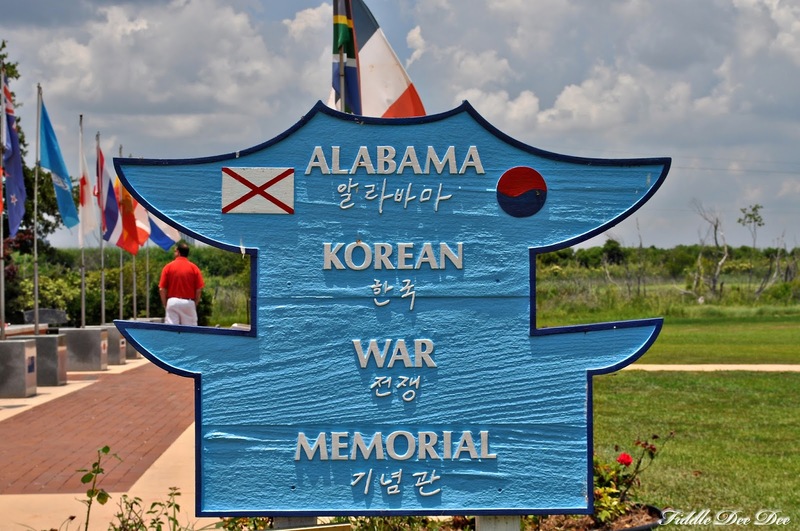 No longer is the Ship the memorial, but the state has constructed an entire Memorial Park dedicated to all the soldiers and sailors from Alabama who has served and even lost their lives for our country throughout many wars. 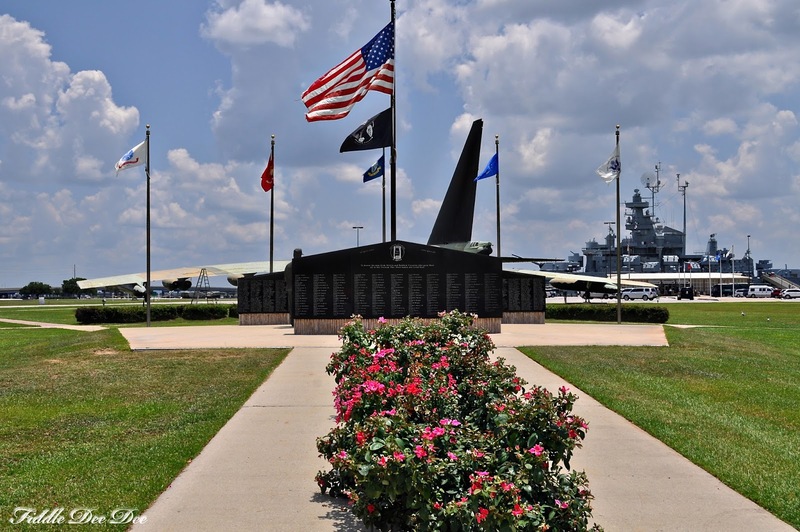 There is no way to post pictures of everything, but here are a few highlights of the Memorial Park and the USS Alabama. 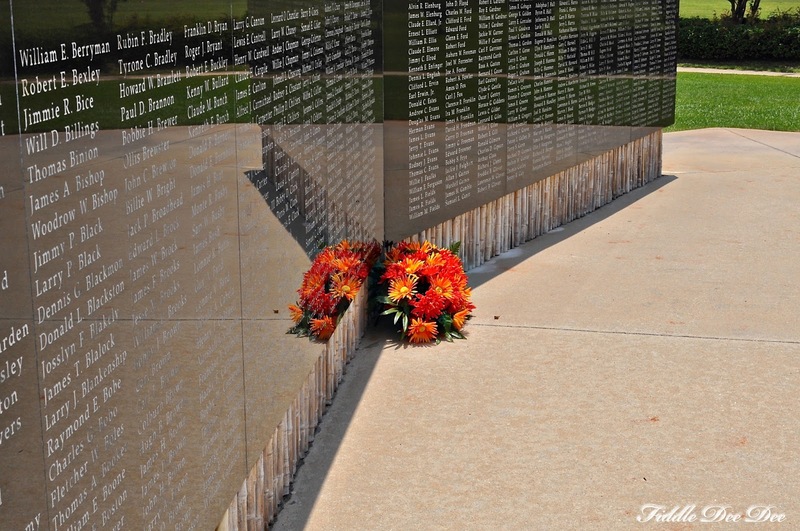 Replica of the Vietnam Wall containing the names of Alabama’s men and women who were killed in this conflict. My father has several classmates whose names are etched here. It’s a very moving and sobering spot to visit. 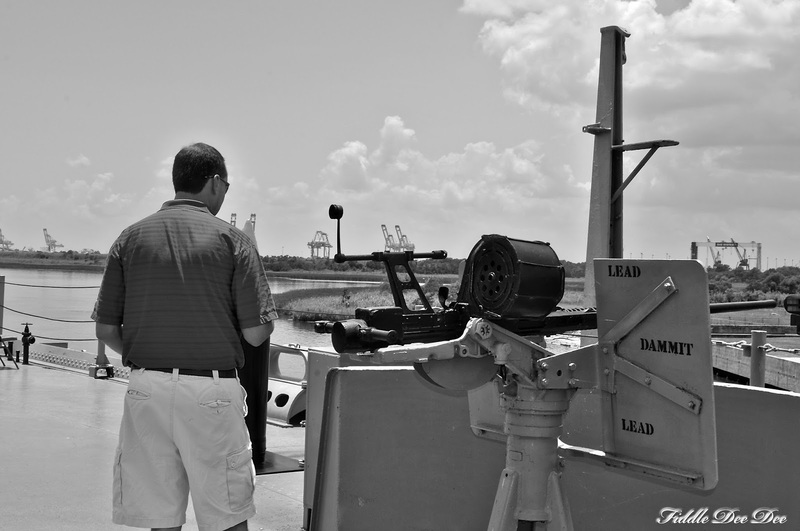 Seeing the open guns reminded me of how vulnerable of our servicemen really are when they are out fighting for us. 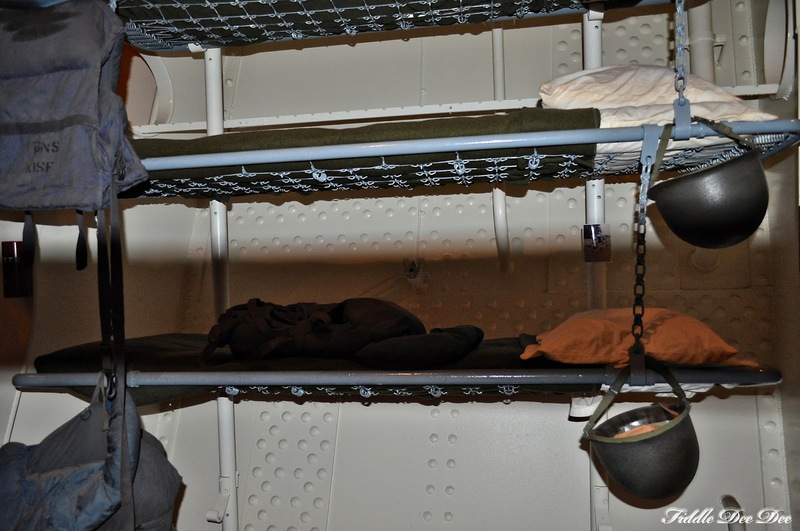 Bunks for the sailors and marines onboard…. close quarters for sure! 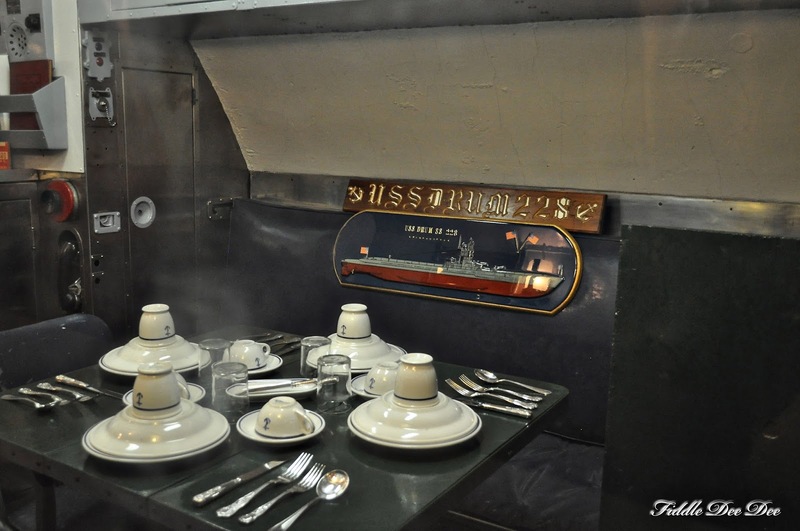 Shipboard amenities for servicemen away from home. 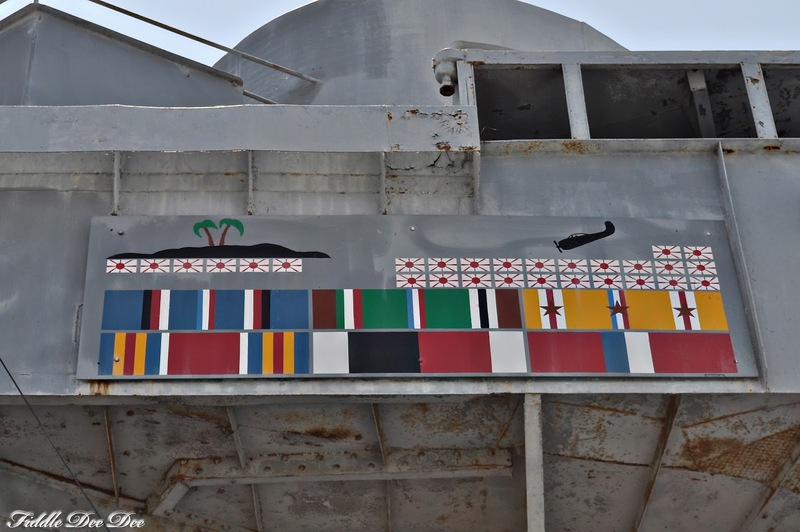 The Alabama’s service record is permanently recorded on the side of the ship. While touring the ship I learned so much about the lives of the men on board, how they lived everyday and how they fought to protect our freedoms. One thing I found so fascinating was the Presentation silver displayed. 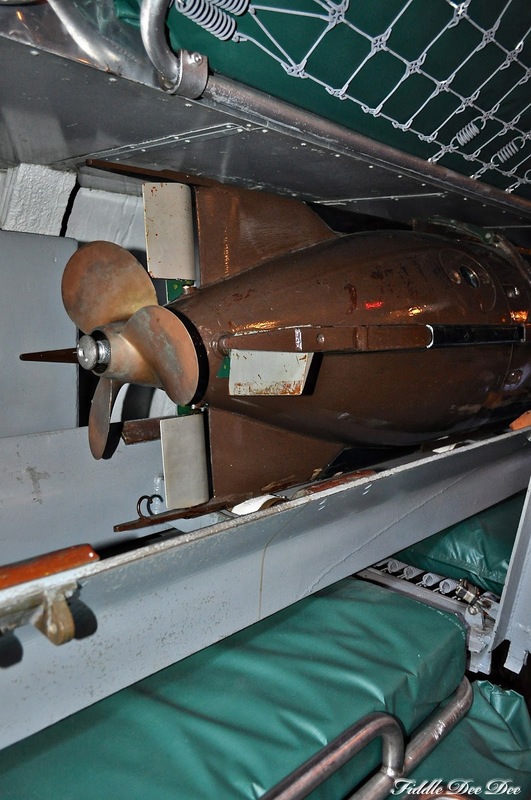 While it was removed for it’s own protection during the war, generally it is left on board. 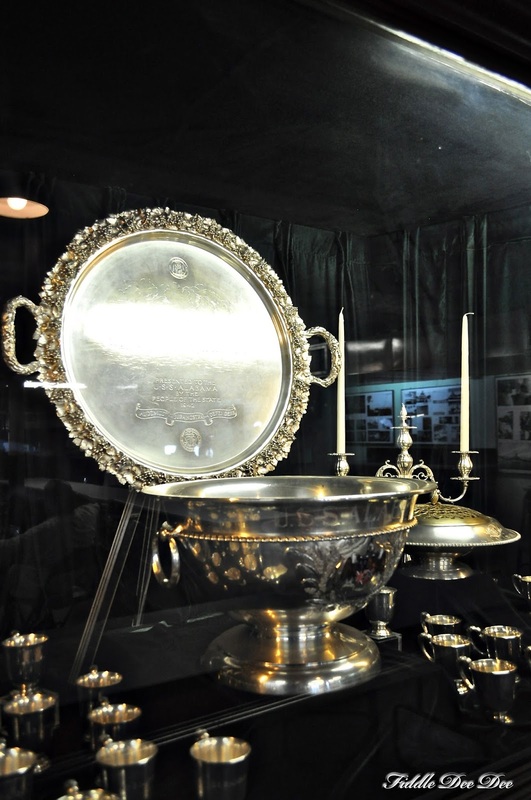 Here’s little history on the presentation silver: During the 18th century it became traditional for cities and states to present silver serviced to the warships bearing their names upon commissioning. 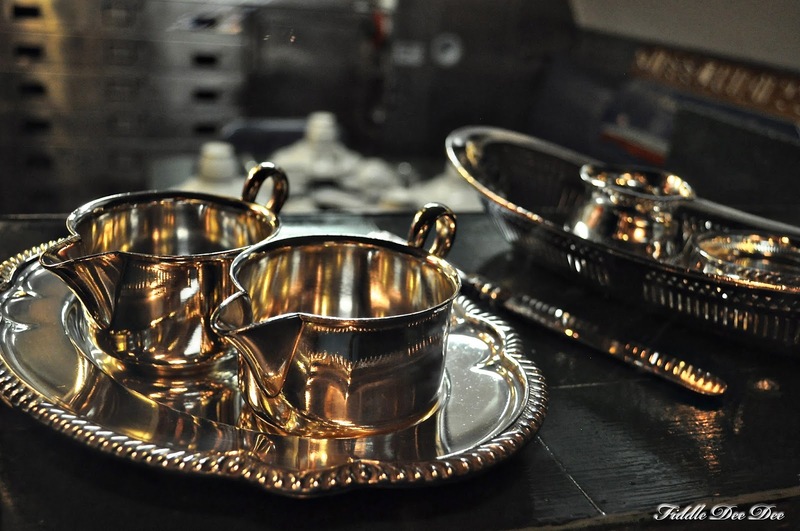 This silver service was designed for use on formal occasions such as port visits attended by local dignitaries. 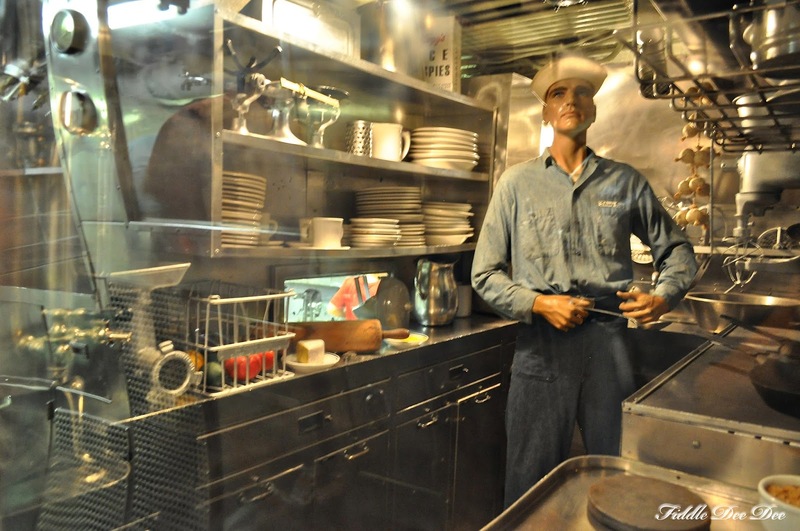 The US Navy withdrew silver services from all warships in WWII, leaving Alabama’s service stored in the State’s archives during the ship’s active service. The silver was placed on board the USS Alabama for display in 1967 but has never been formally transferred from the state archives. The USS ALABAMA’s presentation silver. 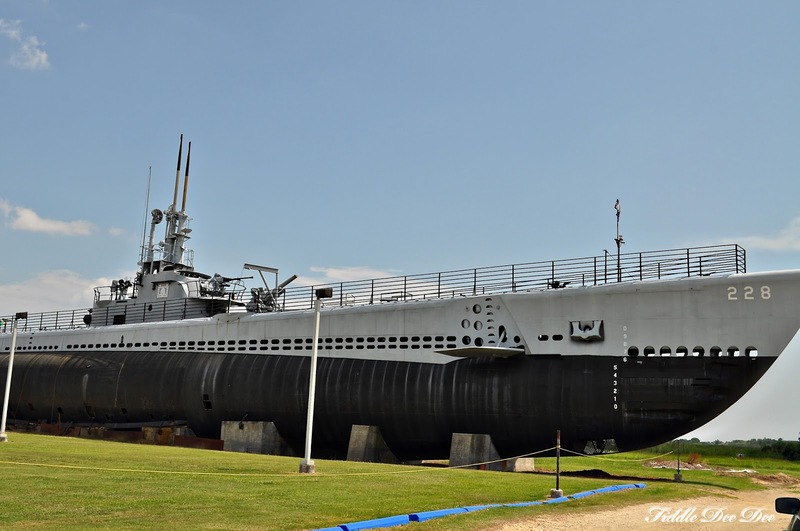 Besides home to the USS Alabama, Battleship Memorial Park is also the final destination of the USS Drum a WWII era submarine that was launched in 1941 and was donated to the USS Alabama battleship commission in 1969. 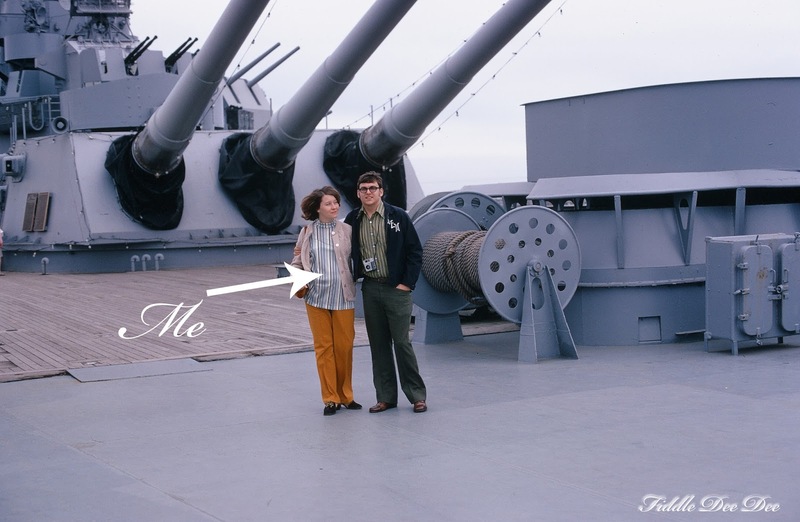 Since I married a Submariner, visiting the USS Drum was very important to Audley. As he descended the steps into her hull he inhaled deeply, taking in the smell of submarine living still in the air after all these years. I found it all quite emotional actually. 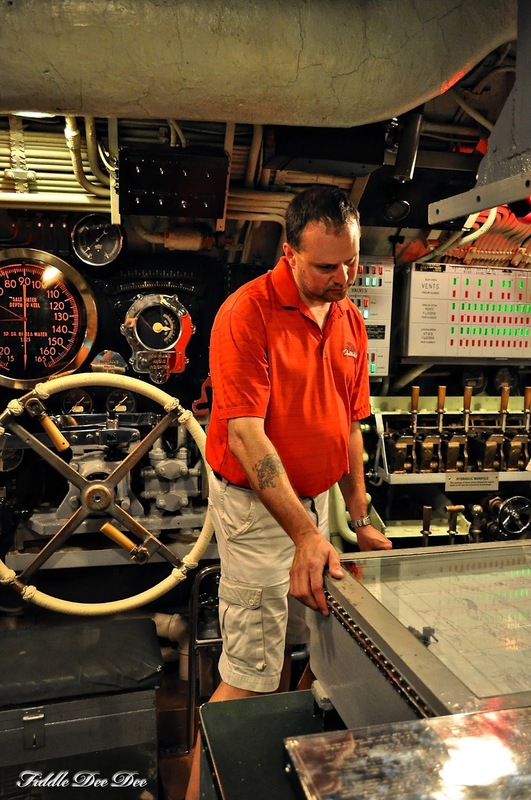 Audley in the control rooms of the sub looking at navigation charts. Yes, those are beds, both over and under the torpedo. Yes, that is how our sailors sleep. The officers were spoiled, just a little, although they still didn’t have much space. 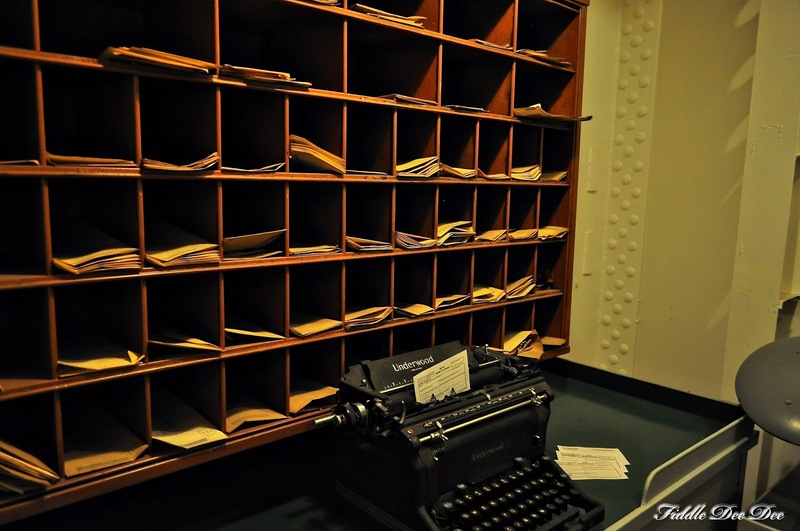 The USS Drum’s service record in WWII. Audley & I on deck of the USS DRUM. 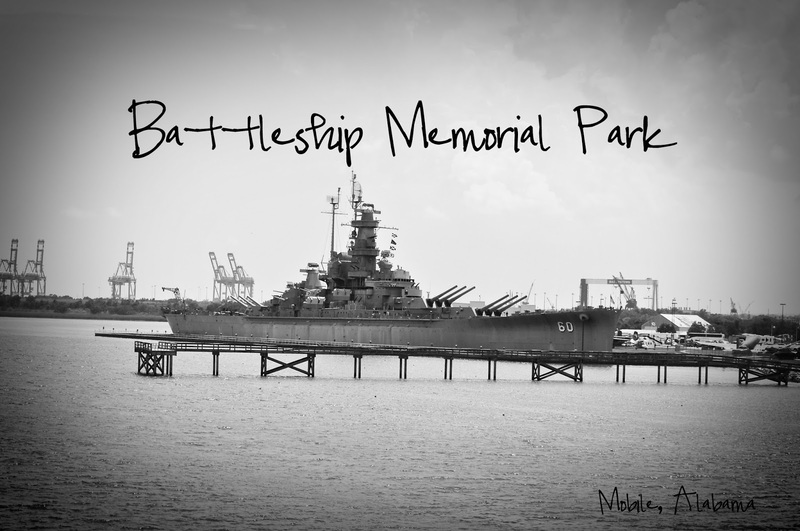 I hope you enjoyed a little of our visit to Mobile and the Battleship Memorial Park. 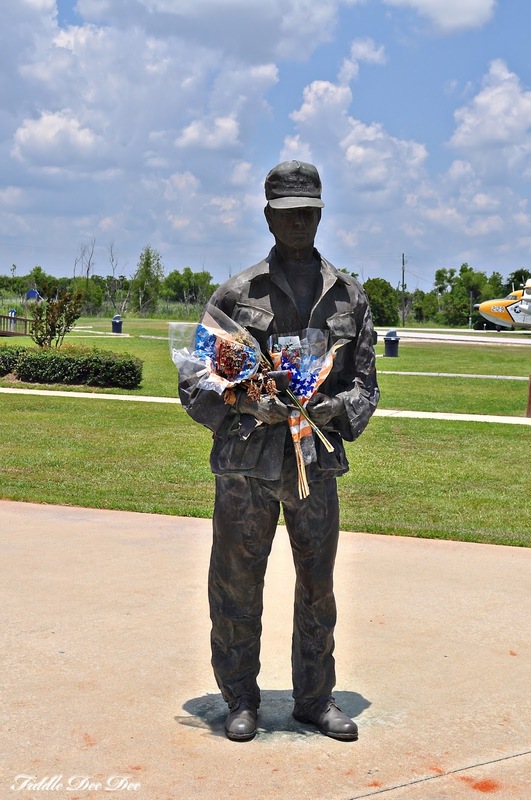 I know military history can seem rather boring, especially for a female, but I can assure you, a stop at one of our nation’s many military memorials will sure give you an whole new perspective and appreciation on our men and women who have and who continue to serve. Next on our adventure we enjoyed a little R&R in Palm Beach, Florida complete with dinner by the ocean, shopping millionaires row and some high-end antiquing! “Is there any encouragement from belonging to Christ? Any comfort from his love? Any fellowship together in the Spirit? Are your hearts tender and compassionate? Then make me truly happy by agreeing wholeheartedly with each other, loving one another, and working together with one mind and purpose. I sure don’t have an answer, but this last week I do know that the future of our country is going to be OK.
A group of high school students in South Pittsburg (just a few miles away in Tennessee) completely and totally gave away a trip that they had planned to help the family of a young man who was killed in the tornados. The young man was a classmate of my Madeline, so this story has really held her attention and meant so much to her. FROM our Local News Channel in Chattanooga…. 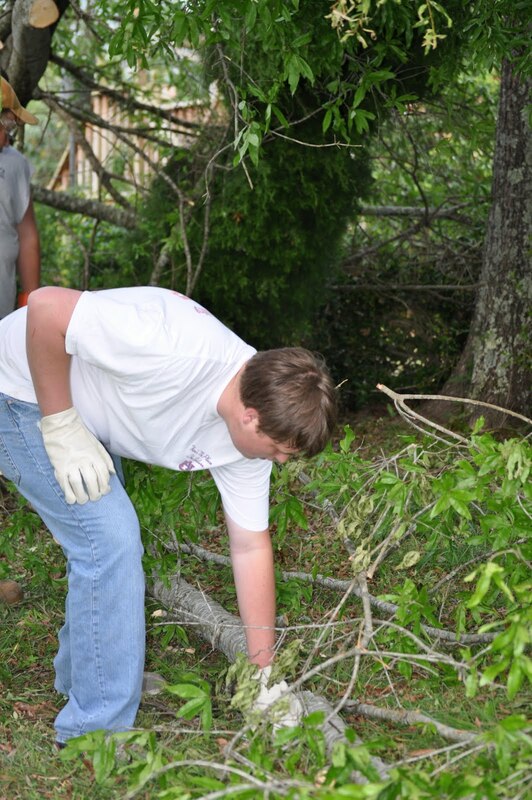 After the devastating storms that affected our area last week, one group of students at a local high school are ready to help aid storm victims, and in a very unselfish way. Mary Kathrine Dawkins’ Transition/Life Skills class at South Pittsburg High School have been working hard all school year to raise money for an annual class trip. At the end of each school year, Dawkins, and her assistant, Elizabeth Mount, accompany the class on a trip (usually to a nearby beach) to celebrate the end of school each year. Some of these students have never had the opportunity to see the beach, much less travel until this trip. This year the class worked hard to raise money by selling soft drinks, making “spirit buttons” for school events and ball games, as well as putting their button-making skills to work to make campaign buttons at election time. Their hard work resulted in the class raising $2,000, which they decided to use for a trip to Tybee Island, GA later this month. With the news of last week’s storms and all of the local devastation, the class wanted some way to help victims of the storm from around our area. 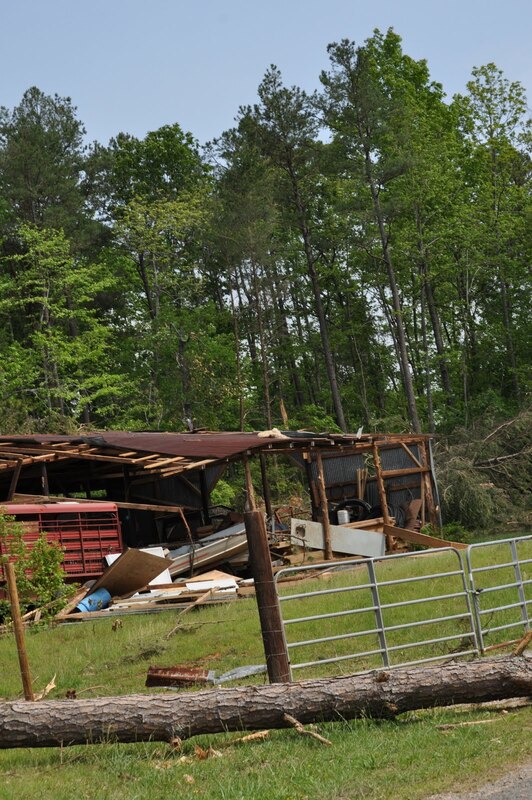 They met Monday and unanimously voted to give the money to victims of the tornado that affected nearby Bridgeport, AL. Teachers Dawkins and Mount gave their full support of their decision and went to SPHS Principal Allen Pratt to get final permission to continue with the wishes of the class, of which he obliged. The class has decided to donate the money to a Bridgeport family who lost their 12 year old son in Wednesday’s storms. 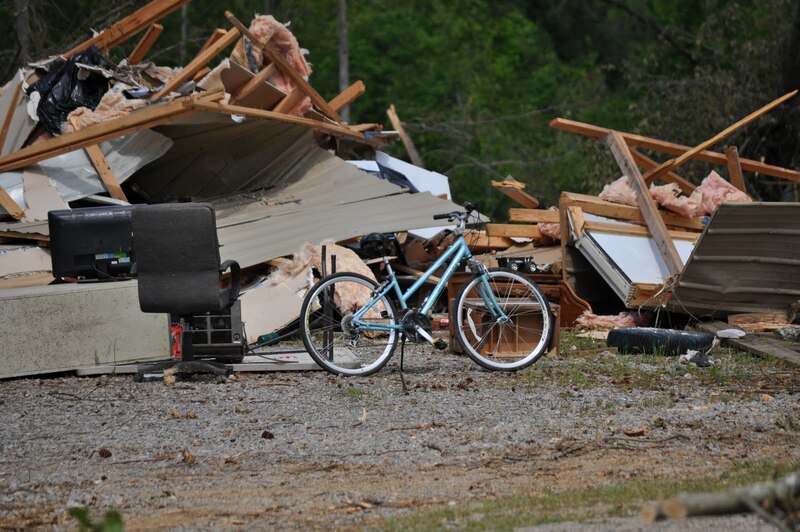 The family’s home was also severely damaged, and the mother remains in an area hospital in critical condition. The class hopes the money they raised will help this local family in their time of need to cover medical expenses and funeral expenses for their departed loved one. There is more to this story as the story got out, an anonymous donor gave money for the kids to take the trip and a hotel in Tybee offered them free rooms and meals so that they could take the trip anyway! As I have seen young people work and pull together for the benefit of others by giving their time, it is clear that a lot of good is to come in their futures. You hear a lot of negative talk about young people today, but all I can say is you really ought to get to know some of them before you speak. They can teach us more than you could ever imagine. If you want to help in anyway, please contribute to your local Red Cross or you can contribute to this nonprofit organization out of Nashville, Church of Christ Disaster Relief. These two groups have done wonderful things for our little state.